It's all the rage these days to push back against holistic medicine - a medical practice which takes the whole body and all of its physiological processes into account before making a diagnosis - and dismiss it as "hippy-dippy baloney". But honestly? The truth is that the human body is one large, interconnected organism. It is very common for a malady in one part of the body to manifest itself in another, seemingly unrelated area. But that makes medicine much more difficult and complicated, so it's easy to see why people would want to stick their heads in the sand and pretend like holistic medicine is irrelevant or silly. Why do we preface this article by hopping up on that particular soapbox? Because this article, in essence, is chock full of holistic health advice. After all, how many people would imagine in a million years that what you eat during the day would have anything to do with how you sleep at night? Unfortunately, the short answer is: not many. If you are one such person, get ready to learn something new. Your diet has a lot more to do with your nightly rest (or lack thereof) than you may have realized. We will also provide some helpful suggestions to make your diet as sleep-friendly as possible. If you think about it, this diet makes a lot more sense than the way we normally eat. After all, if you're about to go on a road trip, would you start out with a nearly empty gas tank and gradually ramp up how much fuel you put into your car the closer you get to your destination? No, of course not. You fill up your tank from the very start, and you keep topping off as necessary throughout your trip until you get close to your destination. Think of your stomach like a gas tank: you need as much fuel as you can get early on for a strong start to your day, and you need less and less the closer you get to winding down for the night. This eating pattern is also helpful if you're trying to lose weight. Your insulin sensitivity is highest in the morning, which means that the calories you consume for breakfast are the most likely to be burned for energy and the least likely to be stored as fat. As far as specific sleep-friendly foods go, get ready to spend a lot more time in the produce section of your grocery store. The more whole food you eat, the easier it will be for you to sleep at night. Whole foods contain the greatest amount of macro- and micro-nutrients that you need to regulate your sleep hormones for easier, high-quality rest. You need the amino acids in protein to create tryptophan, serotonin, and melatonin. You need complex carbohydrates from fruits, vegetables, and whole grains in order to get a healthy amount of B vitamins for tryptophan production and sleep hormone regulation. Lastly, you need fatty acids from healthy sources of dietary fat (think nuts, eggs, dairy, olive oil, etc.) in order to reduce the frequency of sleep disturbances. Skimp on any of these areas for whatever reason, and you can look forward to tossing and turning at night. Don't Forget Exercise and Sunlight! Finally, you need to find a way to work exercise into your new sleep-friendly diet. The earlier in the day you work out, and the more time you spend outside doing it, the better off you will be. Exposing yourself to direct sunlight during the day conditions your body to produce more melatonin at night. Exercising more also helps exhaust your body, which makes falling asleep at the end of the day much easier. The final step is to improve your sleep hygiene by reducing your exposure to blue light in the evenings. When the sun goes down, your brain is supposed to be producing melatonin, the sleep hormone. But blue light from electronics closely mimics sunlight in a way that tricks your brain into thinking it's still daytime, and it stops producing melatonin. Try reading a book instead, or investing in some anti blue light glasses if you cannot stay away from your electronics before bed. Of course, this is just the tip of the iceberg. 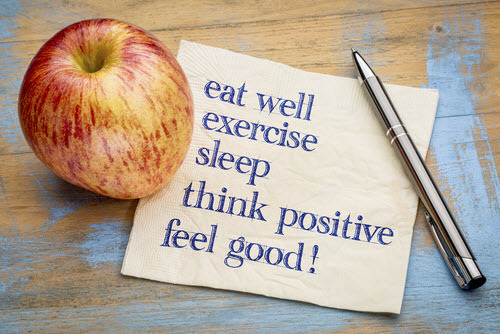 For more detailed advice on how to improve your sleep hygiene, what to avoid on a sleep-friendly diet, natural sleep supplements which can improve your rest, and more, keep checking back for future blog posts!